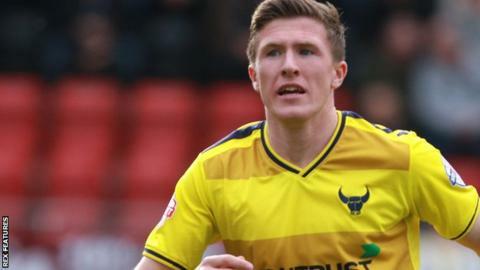 Oxford moved up to second in League Two as second-half goals from John Lundstram, George Baldock and Liam Sercombe saw off Exeter. Lundstram opened the scoring with a placed strike from distance after latching onto Alex MacDonald's pass. Oxford made it 2-0 when Baldock's driven effort took a deflection past goalkeeper Bobby Olejnik. Sercombe broke through late on and chipped over Olejnik to secure the win against his former club. Match ends, Oxford United 3, Exeter City 0. Second Half ends, Oxford United 3, Exeter City 0. Attempt missed. Clinton Morrison (Exeter City) right footed shot from the centre of the box is just a bit too high. George Baldock (Oxford United) wins a free kick on the left wing. Goal! Oxford United 3, Exeter City 0. Liam Sercombe (Oxford United) right footed shot from the right side of the box to the bottom right corner. Assisted by John Lundstram. Attempt saved. Kemar Roofe (Oxford United) right footed shot from a difficult angle on the right is saved in the bottom right corner. Attempt saved. Kemar Roofe (Oxford United) left footed shot from the centre of the box is saved in the centre of the goal. Attempt blocked. Callum O'Dowda (Oxford United) right footed shot from very close range is blocked. Attempt saved. Callum O'Dowda (Oxford United) right footed shot from the centre of the box is saved in the centre of the goal. Substitution, Oxford United. Callum O'Dowda replaces Chris Maguire. Ollie Watkins (Exeter City) is shown the yellow card for a bad foul. Chris Maguire (Oxford United) wins a free kick on the right wing. Attempt missed. Tom Nichols (Exeter City) header from the centre of the box misses to the right. Attempt missed. Chris Maguire (Oxford United) right footed shot from outside the box is too high. Substitution, Exeter City. David Wheeler replaces Jamie Reid. Goal! Oxford United 2, Exeter City 0. George Baldock (Oxford United) right footed shot from the centre of the box to the bottom left corner. Corner, Exeter City. Conceded by John Lundstram. Corner, Exeter City. Conceded by Joe Skarz. Attempt missed. John Lundstram (Oxford United) right footed shot from long range on the left is just a bit too high. Chris Maguire (Oxford United) wins a free kick in the defensive half. Attempt saved. Ollie Watkins (Exeter City) right footed shot from outside the box is saved in the centre of the goal. Attempt missed. Kemar Roofe (Oxford United) right footed shot from the centre of the box is close, but misses to the left. Substitution, Exeter City. Lee Holmes replaces Joel Grant. Ollie Watkins (Exeter City) wins a free kick on the left wing. Attempt missed. Liam Sercombe (Oxford United) right footed shot from the centre of the box misses to the right.